I have finally had some time to sit down and put together some thoughts on our second SBS event that happened on Friday 12th February 2016 at the ICC in Birmingham. As with any event that Aye and I attend a lot of organisation goes into actually getting us there in the first place.. organising school and pre-school drop offs and pick ups and who is going to look after our four. We have two boys- 6 and 4 and two girls 2 and 9 months old. Again my dad and our dear friend Alex helped us out. It was the first time we had left our youngest for a whole day, she is 9 months and seems to be permanently by my side! I knew she would be fine, it was me I knew would be missing her! On our way to Birmingham, feeling ready to be inspired! But we managed to sort everyone out and set off for Birmingham in the morning ready to go and meet Theo Paphitis and 1500 other winners from the past 5 years. SBS is becoming such an amazing community. It is like a huge family of support and encouragement - just what small businesses need! Some people wonder what all the fuss is- but do you know- you get out of SBS what you put in. Like with anything you can't expect to sit back and let good things come to you if you don't put yourself out there and network. Before I start talking about the day, I need to give a bit of background into SBS and how it started and what it is. I think it started in around 2010. 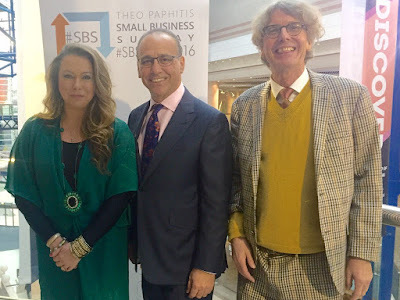 Theo Paphitis (of Dragon's Den fame and owner of a few well known high street businesses - Rymans, Boux Avenue and Robert Dyas) was sitting in his kitchen on a Sunday evening and keeping himself occupied by looking up something called Twitter. He soon discovered that it was an excellent tool for businesses to market themselves, but also to strike up conversations with other businesses and be seen and heard by thousands relatively easy. He tweeted that the first 6 small businesses to tweet him would get a RT from him. He was helping to give exposure to them through his thousands of followers. What he didn't expect was 100s of tweets to come in! So he changed and said he would look through the tweets and pick 6. Then the following Sunday people were actually tweeting him asking for RTs and so SBS was born. Now he has so many small businesses tweeting him that he reveals the 6 winners on a Monday and yes he does pick them himself. SBS (Small Business Sunday) is far greater than the RT from Theo. For us it has been invaluable. We have made friends with businesses all over the UK through SBS. There is a lot of support and encouragement. As a small business it can be quite lonely, you go through so many ups and downs- but this lot really understand and they help you to be strong and improve. There is so much to learn. The yearly (free!) event that Theo puts on is designed to bring everyone together, he always has something new to share with the SBS family. There are inspirational speakers and a question time with a panel who have started small just like all the small businesses there. After some speaking from the sponsors of SBS (thanks to them the event is free!) the main man Theo took the stage. He reminded us why we were all there and introduced a new element of the SBS family for 2016 which will be the SBS shop - an exclusive website to show case our products and services! As always Theo talked about being passionate about your business and letting that passion shine through- tell YOUR story- there is no one like you! I really enjoyed this question time and I was even brave enough to stand up and ask a question! Go me! I was so nervous inside but I managed it and hopefully didn't go bright red like I normally do. So, I could quite easily waffle on about the day's events but instead I have 4 main points to mention that we took away from the day. 1. Don't underestimate the power of social media. For us as a landscaping company social media is predominately used to strike up conversations with other businesses and show case our work. We don't expect work from it, we just use it to be erm... social! However, you would not believe the friendships and relationships that can come from starting a conversation on Twitter and from Theo's simple idea around his kitchen table we now have friends that we would never have known otherwise. An amazing bunch of genuinely lovely people that we have come to know as a direct result of winning SBS. 2. Treat a complaint as a gift! So as mentioned before, I was brave enough to ask two questions this year and one of them was: "In your experience what is the best way to deal with a complaint"
Straight away Holly Tucker answered: Treat a complaint as a gift. It is like free business advice! After all you want to get things right for your client's so listen to the people that matter the most! Yes it is hard to take it on the chin and not take it personally. But it will make you grow and get better. 3. 1,2,3 action..... Use more video! Theo confessed to being a YouTube junkie! He said video was hugely powerful in influencing a customer's potential purchase. Video is great for showing who you are, what you do and how you can help a client. We must make use of this, this year. I can imagine our team will be thrilled with me! I pester them enough for photos now I will be capturing them on film! The world is changing, technology is changing. Keep on top of it. Keep your business current. What works today may not work tomorrow. A few years back everyone was talking about the high streets dying, then out of no where, click and collect started. People wanted to buy online but wanted the choice when to pick it up and not have to wait in hours for a package. Do what works for your business and for your clients. Make it easy for them to see what you do, how much it costs and how they can get that service. Don't over complicate your business. Theo suggested stripping your company back to who you are and what you do. Mike Pickles talked about his boxes. They are a box for goodness sake he said! But.... they are a box that has intelligent plastic. They can organise your home and sort out your memories. When your home is tidy so is your mind. Gosh was he passionate about a box!! He also mentioned that he has incredible machinery that makes his life easier. Once he was the one that took the orders, opened the post and packaged up the boxes and sent them. Now he embraces technology to do a job far better and has 100+ staff. Whatever you need to do to make your business run smoother then do it. Our heads are still buzzing from the day and I must start making a plan of my ideas for 2016! I have started following Holly Tucker on Instagram as she posts some inspirational nuggets. I hope this post inspires others to join the SBS family by entering SBS every Sunday 5:00-7:30 and show your passion for your business in one tweet to Theo.